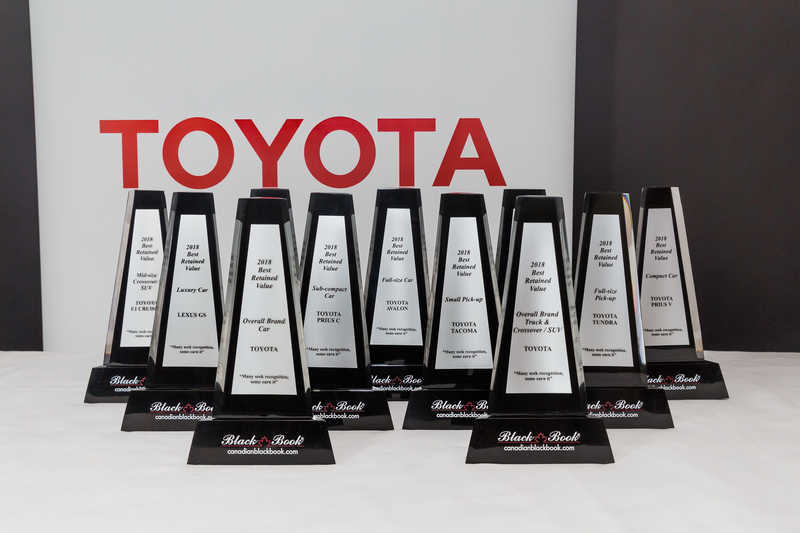 TORONTO, ON – February 14, 2018 – Toyota Canada Inc. (TCI) has once again won an industry-leading 16 awards for residual / retained value: 11 Canadian Black Book (CBB) Best Retained Value Awards and five ALG Residual Value Awards – more than any other auto manufacturer for the ninth straight year. Toyota was also named the Top Overall Brand for retained value (cars, and trucks/crossovers/SUVs) by CBB. For many Canadians, a new vehicle is their first major purchase – and Toyota is committed to helping customers protect their investment by building quality and dependability into every model. That’s why Toyota and Lexus cars, trucks and SUVs continue to receive awards from CBB and ALG – again and again. The Canadian Black Book Best Retained Value Awards recognize vehicles that retain the highest percentage of their original manufacturers suggested retail price (MSRP) after four years. For 2018, the CBB program analyzed model year 2014 vehicles in 20 different categories, plus three Overall Brand categories. The ALG Residual Value Awards recognize vehicles from the 2018 model year that are forecast to retain the highest percentage of their MSRP over the next four years.